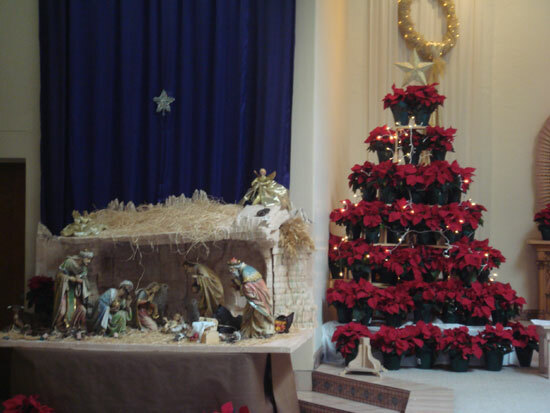 The nativity scene is displayed during the Christmas season. The church is decorated for the season. Notice the Christmas tree made with poinsettias. During Advent we celebrate the Feast of Our Lady of Guadalupe. Members of the Piro-Manso-Tiwa tribe at the Feast of Our Lady of Guadalupe. Dances are performed in honor of Our Blessed Mother. With the rhythm of the drums the Indians dance. The church looks clean and empty before the celebration. The Arts & Environment Committee always does a great job decorating the church. Members of the Piro-Manso-Tiwa tribe at St. Genevieve’s church. The dancing by the Indians continues day and night. Members of the tribe on December 12, 2008. Statue of Our Lady and stain glass windows of St. Joseph, and Our Lady of the Rosary. Pinatas are prepared for the traditional “posadas”. Getting hungry? Roberto’s is the place. Look at the board.